The Chichi® is a trademark since 2008. It is registered at the Bureau of Intellectual Property (BIP) on Curaçao, in Europe and in the United States. The trademark guarantees that the handmade and hand painted commercial souvenir line and original pieces of art are authentic, original, made in Curaçao and of indisputable high quality. Every Chichi® sculpture or souvenir is inscribed with an original logo, name, location at which it was produced and trademark coin. The bright trademark colors of these coins change every year and relate to the specific period in which the Chichi® was produced. The trademark ensures the high quality of the product , it’s production process and its system of quality. 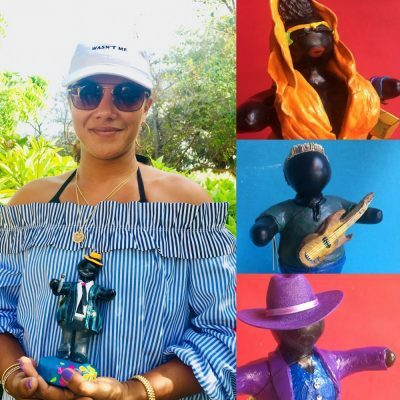 The Chichis® and other souvenirs, produced at Serena’s Art Factory on Curaçao, are created by a team of experienced local craftsmen and over fifty painters, trained by Serena herself. When you take home a Chichi®, you take home an original, colorful and desirable souvenir or piece of art. Your purchase helps to empower the local community of Curaçao and its craftsmen and painters to earn extra income and further develop their talents and skills. Always dreamt of being famous for a day? Our Chichis® do as well!